After crafting the ambitious Bharat Nirmaan and the National Rural Employment Guarantee Scheme, putting in place the enabling legal framework and even arranging funds, the UPA government under Dr Manmohan Singh is set to take the next significant step: their implementation. The Food Corporation of India was formed to act as a bulwark against perennial food shortage and greed of the middlemen. It has proved to be anything but that. Rather, it has become a byword for inefficiency and corruption. GUDIYA died of gynaecological problems in a Delhi hospital on Monday. Most people would blame destiny for what has happened to her. Marriage was thrust upon her when she should have been studying. Pakistan’s largest province, Baluchistan, is again on the boil. Two rocket firing incidents took place in early December, 2005. The first incident involved firing on a helicopter carrying the Inspector-General of the Frontier Corps. 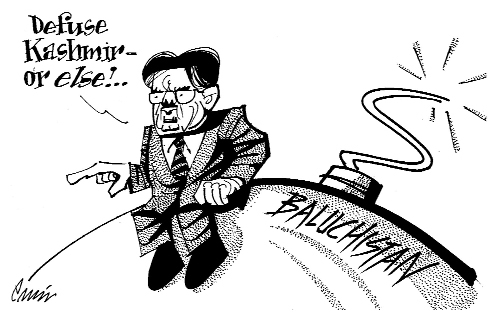 In the second, a rocket was fired at a public meeting addressed by Gen Pervez Musharraf at Kohlu. THE country’s domestic flag carrier Indian (Airlines) plans to adopt the Japanese method and paint abstract drawings and sketches on its planes in a bid to scare away birds which are blamed for numerous accidents. Recently Chandigarh hosted a seminar regarding the country’s foreign policy and its effects on national security. Mr Jaswant Singh, former Foreign Minister, made interesting observations and often referred to the fact that he was an Army officer in the fifties. He stated that the present- day Army had changed a lot from that of the Army of the fifties. Corruption has now crept in the Army also. In medical research, nobody is convinced by a single experiment. A finding has to be reproducible to be believable. Only if different scientists in different places do the same study and get the same outcomes can physicians have confidence the finding is actually true. Only then is it ready to be put into clinical practice. First of all, work out what kind of riches you are aiming for. Unless you go the traditional route and inherit it, making serious money will involve some sort of sacrifice. So decide what really constitutes riches for you. Is it just money or is it freedom, friends and lots of leisure? After crafting the ambitious Bharat Nirmaan and the National Rural Employment Guarantee Scheme, putting in place the enabling legal framework and even arranging funds, the UPA government under Dr Manmohan Singh is set to take the next significant step: their implementation. In 2006 the Prime Minister and his team plan to focus on implementation, infrastructure and investment. Government programmes often flounder due to their poor implementation and ineffective monitoring. The delivery system is scandalously prone to leakages. To ensure that the UPA programmes live up to public expectations and succeed despite the general mood of cynicism about government schemes, the Prime Minister’s Office has taken the responsibility of monitoring them. Infrastructure and investment are inter-linked. Investment does not flow in for lack of infrastructure and infrastructure does not come up for lack of funds. While national highways are getting the desired attention and aviation too is at the take-off stage, power remains the problem area. Given the nasty Enron experience and the messy state of power boards, it will be hard to light up this sector for foreign investors. While the government cannot rely on foreign funds alone, its fund-raising capacity is limited and any over-spending would widen the fiscal deficit. The irony of the Left again deciding to intervene more frequently in policy-making and stall the disinvestment process cannot be lost upon any close observer of the economic scenario. The most serious threat to programme implementation is expected from the states. First, because barring a few, they may not be able to cough up the required funds for national schemes. Secondly, the quality of political leadership and official machinery at the state level does not match the one at the national level. The Central leadership’s helplessness is seen from the fact that it has not been able to convince state-level politicians about the futility of populist plans like free power to farmers. These are challenges not entirely insurmountable. The Centre needs a lot of tact and tenacity. The Food Corporation of India was formed to act as a bulwark against perennial food shortage and greed of the middlemen. It has proved to be anything but that. Rather, it has become a byword for inefficiency and corruption. The extent of pilferage is monumental. Instead of arranging adequate supply of grains for the people all over the country, its sole purpose seems to be to procure foodgrains and store them till a chunk vanishes into thin air or becomes unfit for human consumption. There is a method in this madness. Hundreds of unscrupulous persons make a neat pile in the process at the cost of the poor people. In such a hopeless situation even a minor attempt to set things right needs to be lauded. FCI top brass has recently charge-sheeted 164 officials and blacklisted 166 rice mills in Punjab involved in supplying substandard rice to the central pool with the connivance of certain officials. Even an operation of this scale only scratches the surface, but at last some action is being taken against the corrupt. The procurement of substandard grains for political reasons happens to be the mother of corruption in this organisation. What the leaders do for the sake of votes becomes an excuse for the corrupt employees to emulate for the sake of notes. Then there are a thousand other scams going, comprising everything from the purchase of substandard gunny bags to the siphoning off of a huge quantity of grains in transit. This seems to be a well-oiled racket. Since the rot has travelled to even senior levels, precious little is done about it. If the government investigates the numerous scandals in right earnest, it will find plenty of skeletons. Not only are the needy being deprived of edible food, consignments sent abroad are returned because their quality is nowhere near even the minimum acceptable. The nexus between politicians, bureaucrats and businessmen is doing its best to bring a bad name to the country. GUDIYA died of gynaecological problems in a Delhi hospital on Monday. Most people would blame destiny for what has happened to her. Marriage was thrust upon her when she should have been studying. Within a month of her marriage, she became a “widow” only to get married to another person in due course. But when her first husband who was presumed to have died in the Kargil war returned from a Pakistani jail, she was already in the family way. That was when an intense “debate” occurred on her in newspaper columns. Who had greater claim on her – the first husband or the second? What about the paternity of the “child”? Gudiya could have herself decided all this. But that was not to be. At that juncture, a news channel thought of what it called a “historical intervention”. It organised a “live panchayat” where the families concerned and some clerics were brought together. It was titled “Kiski Gudiya?” (Whose Gudiya?) with a sub-title “Yeh Kaisa Bandhan?” (What kind of a bond is this?). It was telecast live into millions of households. The panchayat was conducted under the framework of the Shariat (Islamic law) and the anchor constantly reminded the viewers that any decision had to be taken within this framework. Did Gudiya know the Shariat? The anchor used all her skills to force her to take a decision. What mattered to the channel was clear when the anchor announced, “Isi majlis mein faisla hoga” (the decision will be taken in this gathering). Gudiya had no time to reflect upon. Nor was she given a choice. Ultimately, Gudiya decided to stay with her first husband. The second one, who lost in the bargain, expressed his willingness to shoulder the responsibility of bringing up the child all by himself. The point to be noted is that the anchor was not prepared to allow a dissenting voice in the whole proceedings. The “panchayat” was to decide the fate of a woman but no women were allowed anywhere near it. “Gudiya ki marzi” (Gudiya’s wish) everybody sighed when they departed from the panchayat. If she belonged to a rich family, would the channel have organised this farce? What mattered to the channel was not “Gudiya ki marzi” but viewership rating. She was forgotten the moment the arc light was switched off. Choice was not a word that existed in her lexicon. This is true of countless Gudiyas of this nation. Pakistan’s largest province, Baluchistan, is again on the boil. Two rocket firing incidents took place in early December, 2005. The first incident involved firing on a helicopter carrying the Inspector-General of the Frontier Corps. In the second, a rocket was fired at a public meeting addressed by Gen Pervez Musharraf at Kohlu. These incidents appear to have provided an immediate provocation to launch an operation by the Pakistan Army and the Frontier Corps against Baloch insurgents. Any operation in which 12 helicopters and air strikes by fighter aircraft are employed, and in which about 120 tribesmen are reported to be killed in bombings has to be a major one. So far, 35 security forces personnel have been killed in the ambushes laid by the insurgents. Islamabad claims that the operation is against a “terrorist network” and the government is “determined to destroy it to facilitate a development process that would bring the backward province to the same level as other developed regions of the country”. The Human Rights Commission of Pakistan (HRCP) has described the situation as “alarming”. Its chairperson, Ms Asma Jehangir, has stated that Baluchistan is being pushed towards isolation and her commission would highlight “excesses, oppression and violations” of human rights against the people of the province. She alleged that the government had created security problems to justify the establishment of additional military check-posts. Baluchistan has had a chequered, though not an unfamiliar, post-independence history. It has four princely states — Makran, Kharan, Las Bela and Kalat (the largest and most powerful) — and the Kalat prince, Mir Ahmad Yar Khan, declared independence at the time of Partition. Other Baloch chiefs sympathised with him but did not support his idea of independence. After the Pakistan Army intervened, Mir Ahmed Yar Khan signed the accession agreement. But his brother, Abdul Karim Khan, carried on an armed struggle from Afghanistan, which eventually failed. In the late 1950s, most Baloch and Pashtun tribes got together and took up arms when an attempt was made to change the federal character in West Pakistan by converting it into one unit. Sporadic guerrilla actions continued into the 1960s till the one unit idea was finally dropped. In 1973, the Pakistan government under Zulfiqar Ali Bhutto found some Soviet weapons in Islamabad, supposedly destined for insurgents in Baluchistan. Bhutto promptly dismissed the provincial government. Subsequently, it came to light that these weapons were meant for some other destination and Bhutto, or Pakistan intelligence establishment, had used this “find” to get into the good books of US President Richard Nixon. The Baloch were furious. They started a guerrilla war. About 80,000 Pakistani troops had to be deployed to crush the uprising. The largest confrontation took place in September 1974 when 15,000 Baloch fought the Pakistani Army which used fighter planes and helicopters extensively. By the time General Zia withdrew Pakistani troops in 1977, about 9000 Baloch and security forces personnel had died. Since then, the province, with more arms and refugees flooding into it due to fighting and instability in Afghanistan, has seen violence frequently. Baluchistan remains a neglected backwater of Pakistan due to internal as well as external politics. Over the years, grievances of tribal groups have got compounded. In addition to greater autonomy (and demand for independence by some), both Baloch and Pashtun tribals desire larger allocation of central funds as well as royalty for natural gas, coal and other minerals found in the province. There are explosive social issues too. In January 2005, a Pakistan Army captain sexually assaulted Dr Shazia Khalid, a 31-year-old doctor working at the Sui gas plant, near Dera Bugti. When the Pakistan government took no action, the Bugtis attacked the heavily protected gas plant. General Musharraf revealed Pakistan military’s contempt for the locals when he publicly declared the Army captain to be “innocent”, and warned that if the tribal did not stop shooting, “they will not know what hit them”. The government sent tanks, helicopters and nearly a brigade worth of troops to protect the plant. At least 15 people died in the shelling and gunfire that followed. The incident caused further alienation between the tribes and the Pakistan military. The Pakistan government’s decision to develop Gwadar port with Chinese assistance and Panjabi contractors, re-settlement of a large number of ex-servicemen along the Makran coast, and creation of additional military cantonments in the province has added fuel to the fire. The increased military presence is being perceived as a deliberate attempt to suppress the Baloch nationalists. With land borders along Afghanistan and Iran and several tribal groups straddling across these borders, a sensitive coastline (nautically bounded by the Persian Gulf in the west and the Gulf of Oman in the southwest) not far from Pakistan’s nuclear firing facilities in the Chagai Hills, the insurgency in Baluchistan has strategic significance not only for Pakistan but also for the entire region. Baluchistan and Pashtunistan have long complicated Pakistan’s relations with Afghanistan. The US, whose troops are currently engaged in operations in southern Afghanistan along Pak-Afghan border), is clearly unhappy about a large number of Al-Qaida and the so-called moderate Taliban settling down in the Pashtun majority areas of Baluchistan, and the area continuing to be a hotbed of Wahabi fundamentalism. China, too, has built economic and strategic stakes in the area now. Nearly 500 Chinese are working at Gwadar port (foundation laid by Chinese Deputy Prime Minister Wu Bangguo on March 22, 2002), which is expected to provide the Pakistan Navy with another base and reduce Pakistan’s reliance on Karachi and Port Muhammad Bin Qasim. It will also enable China to monitor its energy shipments from the Persian Gulf to the East. The Baloch instability will be a negative factor in deciding the fate of Iran-Pakistan-India gas pipeline. Indian investment on a pipeline that passes through the insurgency-affected area will need a careful review. The Pakistani prickliness when India expressed its concern over the most recent military crackdown in Baluchistan, not only by its officials but also by General Musharraf himself, has surprised many in the Indian strategic community. Addressing the Council of Pakistan Newspapers Editors in Lahore on December 29, General Musharraf alleged that India is shedding crocodile tears over Baluchistan. He also hinted that India was involved in carrying out subversive activities in the province. Although no one is in favour of using terrorism as a quid pro quo policy option in any part of Pakistan, strategists have often wondered why India remains on the defensive when Islamabad never loses an opportunity to loudspeak on human rights violations in India. In fact, there are many prickly Pakistan-related issues on which India can remain pro-active, e.g. unilateral handing over of Shaqsgam Valley (Jammu and Kashmir) to China by Pakistan and frequent sectarian violence in the Northern Areas. According to the HRCP, more than 67 people were killed due to sectarian violence in the Northern Areas in 2005. It is time for the Pakistan leadership to realise that interference in each other’s internal affairs, support to terrorism and political baiting can be a two-way street. If they persist with that, where would it lead to? Surely, not to a constructive dialogue, or faster economic development in the subcontinent! I have been talking to a city-based surrealist painter — an adherent of Piccasso’s Cubism School — who has been asked by Indian management to submit a few of his recent works and who has been shortlisted to paint the planes. He took me into his penthouse studio and spread out some of his recent canvases. “That’s most reassuring,“ I said and picked up a line drawing. It looked like an under-sized egg laid by an ill-tempered hen on one of its bad mornings. “That’s right,” said the artiste, “and I want you to minutely study this canvas”. It showed two straight lines at right angles to each other with a pointed arrow at the end. I marvelled. This was a modernistic painting at its surrealistic best. “What does it convey?” I asked, scratching my head. “Yes,” said the artiste, “they’ll scare away Indian airlines passengers. One wishes he had also remarked that whenever a case of corruption occurs or is detected in the Army, strict disciplinary action is taken against the offender concerned. Take the case of Tehelka. The Army officers of the ranks of Maj Gen and Brigadier have been court martialled and dismissed. In the case of the two IAS officers involved in Tehelka, not only no action has been taken against them, but one of them has been even promoted. As far the politicians are concerned, no action was taken against the last Defence Minister and even his protégé was let off without any detailed inquiry. During the tenure of Mr Jaswant Singh as Foreign Minister, foreign policy did not adequately address security concerns of the country. Maynmar wanted to purchase weapon systems from India to deal with increasing lawlessness. India refused to do so unless Maynmar did away with military dictatorship and introduced democracy. Now how do the people of Maynmar get rid of its military dictators was not thought of by foreign policy experts. Maynmar’s dictators asked China for the weapons systems. China obliged. Now China in return got the facilities in Cocos island from where it can monitor not only the movements of Indian ships but also our missile tests in the Bay of Bengal. Incidentally, it is not generally known that Cocos island was part of India, when India achieved Independence. It was during Prime Minister Nehru’s tenure that India decided to hand over Cocos island to Burma, now Maynmar as was stated by George Fernandes in his interview to the BBC. Perhaps our foreign policy experts then felt that Cocos island was not of any strategic importance to India, on the same lines as many people at present feel that Sia- chin is of no strategic importance to India. But with time and changing geo-political concerns, the importance of various parts of the country also changes. In any case, no part of a country should be handed over to another country whether it is of strategic importance or not. The Chinese can teach us as a nation a lot about this aspect of nation building and security. In the late fifties, Prime Minister Nehru visited Eastern Command when Lt General Thorat was commanding the Eastern Sector. Gen Thorat has talked about this visit in his book “Reveille to Retreat”. He talked of the increasing threat from China to NEFA as it was constructing new roads to the Indian border. He suggested that India should build defences half way up the border on important features to face the growing Chinese threat. Nehru replied that he was busy bringing about a rapprochement between the Soviet Union and the USA and that it would not look proper if he was seen moving troops towards the border in NEFA. Thorat’s only comment in the book was that Nehru took himself a bit too seriously. As is well known, Prime Minister Nehru had also instructed Gen Thimayya to focus on the threat from Pakistan and that the Foreign Ministry would deal with the China problem. The results are well known. Our leadership had stopped a forward movement of our forces in 1948 by accepting a ceasefire without bothering about our security. In 1965 we withdrew our forces from important features like the Haji Pir pass and in 1972 we handed over one lakh prisoners to Pakistan without bargaining for any decision in J&K by way of a ceasefire line. Now, there has been talk of withdrawing our forces from Siachin without any solution of the J&K problem or acceptance of the ceasefire by Pakistan. This brings us to the Siachin question. Perhaps, many are not aware of the fact that the ceasefire line stops at point NJ 9842, which is just south of the glacier. But if it is continued in the same direction where it stops at point 9842, it goes north-east till the famous Kara Koram Pass on the India-China border in Ladakh. It includes the Siachin glacier as well as the Kara Koram Pass. Incidentally, both Pakistani and US maps show that the LoC continues to follow in the north-east direction from point 9842 onwards. Once we vacate the glacier area, there is no guarantee that the Pakistani forces, which have close lines of communications to Siachin, do not occupy it. Pakistani dictator Musharraf had promised to our Prime Minister that he will do his best to stop terrorist movements to J&K. The results of this promise are well known. The present Chief of Army Staff has given thoughtful recommendations to the government that we should not vacate unless Pakistan accepts in writing our present dispositions on the Siachin border. He has, in fact, set a good personal example for future Chiefs of Army Staffs also. The foreign policy of the government must look after the security of the country, including its territory. The chiefs of the armed forces must be encouraged to speak out their views regarding vital Indian security concerns which are at stake. The issue of civilian supremacy has been distorted to silence the armed forces on important security issues. The government mindset needs to change. The developing situation in Nepal can pose serious security problems for India. China is trying to establish a bridgehead across the Himalayas. China is indeed playing a deep game. Contrary to the past understanding, it has started giving military aid to the King, which India under former Foreign Minister Natwar Singh had stopped. Recently, the political parties in Nepal as well as Naxalites of Nepal have forged a union to share power in the country. So whosoever emerges successful from the present turmoil in Nepal, China stands to gain. Nevertheless, one of medicine’s most overlooked problems is the fact that some questions keep being asked over and over. Repeated tests of the same diagnostic study or treatment are a waste—of time and money, and of volunteers’ trust and self-sacrifice. Unnecessary clinical trials may also cost lives. Two papers dramatically illustrated this problem last year and may have helped nudge the medical establishment toward doing something about it. One article examined 18 years of research on aprotinin, a drug used to reduce bleeding during heart surgery. The other looked at studies on the relationship between a baby’s sleeping position and sudden infant death syndrome. Both concluded that research on these subjects went on long after the answers were known—namely, that aprotinin worked and that babies sleeping on their backs were less likely to die of SIDS. The problem is evident even in research on the highest-profile diseases. In 1992, Joseph Lau, then at the Department of Veterans Affairs hospital in Boston and now at Tufts University, published a paper that has become a classic in epidemiology. He examined 33 clinical trials of streptokinase, a drug that dissolves clots in the coronary arteries of people having heart attacks. The trials were conducted from 1959 to 1988. Lau conducted a ``cumulative meta-analysis’’ of the results. This is done by adding each trial’s patients and their outcomes to all the preceding ones. The result was a running scorecard of streptokinase’s performance. Lau determined that by the end of the eighth trial in 1973, the evidence was clear that heart attack patients who got streptokinase had 25 percent lower death rates than those who did not. That conclusion, and the percentage, did not budge while 34,542 more patients were enrolled in 25 more trials of streptokinase over the next 15 years. The number of unnecessary studies that occur is an open question. Nobody requires that medical scientists review previous research to make sure the question they are asking has not already been answered. This may change, though. The Lancet, a British journal, announced last summer that it will require that authors submitting papers show they performed a meta-analysis of previous research or consulted an existing one. The current state of affairs, in his opinion, is indefensible. When a patient volunteers for a randomized clinical trial, he or she strikes an implicit bargain with the researcher. The patient may benefit, but even if he does not, others will. First of all, work out what kind of riches you are aiming for. Unless you go the traditional route and inherit it, making serious money will involve some sort of sacrifice. So decide what really constitutes riches for you. Is it just money or is it freedom, friends and lots of leisure? If money doesn’t do it for you, then don’t waste time and energy working to make the cash. Always follow what you love and you’ll never be really poor. However, even if you are just aiming at a decent standard of living, resolve to stop wasting money this year. If you want to be rich, or just well-off, studies have shown that the amount you spend is more important than the amount you earn. Even if you make millions, if you spend more than you earn, you will have financial problems. 1 Pay off all debts, including your mortgage, as fast as possible. Start with the ones with the highest interest rates (probably store cards and credit cards) and keep on until they’re all paid off. Aim to pay off your mortgage well before the standard 25 years. Not only does it give you freedom from a huge burden early on, but you save more interest than you would make in a cash account, and it is tax free. 2 Cut all costs. Save thousands by switching your mortgage to a better rate and hundreds by switching utilities. Use websites such as www.uswitch.com, www.buy.com and www.moneysavingexpert.com to find cheaper versions. 3Don’t go shopping. Large shops, and particularly supermarkets, have increasingly sophisticated ways of making you buy things you don’t need and can’t afford. Shop in markets (30 per cent cheaper than supermarkets) and online, where you will be less tempted by impulse-buy offers. 4 Look after the pennies. It really is true that cutting back on small things will help build up money long-term. For example, buy a couple of lattes each day at work and you can kiss goodbye to around £25 a week, which equals £1,250 a year. 5 Invest regularly and wisely. You don’t even have to invest large amounts. Take the above example. Throwing all your spare money at your mortgage each month is an easy, risk-free investment that can save (in other words, make) you tens of thousands of pounds. Never invest in anything that you don’t understand or is advertised on TV, pressed on you by your bank, recommended by a financial “adviser” who you haven’t paid . 6 Be different. Most people lose money by following the crowd when they invest (think of the dot.com bubble and recent property hysteria). Be like top investor Warren Buffett, the second-richest man in the world, who has made his $44bn personal fortune by making his own investment decisions through thorough research. 7 Marry and/or divorce well. According to Datamonitor, there are now more rich women than rich men in the UK, and many have done it through impressive divorce settlements. 8 Run a successful business or do something creative that is highly popular. Certainly, you could make millions doing something you love, as J K Rowling, David Beckham, Rod Stewart and Steven Spielberg (to name a few) have. The richest people in the world, though, have made it through constant hard work building up (or continuing) a business in telecoms, manufacturing, technology, retail, hotels and the like. 9 Hang around with poor people. We tend to rate our level of happiness and wealth by comparing ourselves to others. So, surround yourself with people who have less than you do. 10 Realise that you are already rich. Check www.channel4.com/4money/funnymoney/richometer to see where you rank. You’ll be surprised - for example, if you earn £35,000 or more, you are in the top 1 per cent of the world. The introduction in the Legislative Assembly by Sir William Vincent of a Bill for the repeal of the Press Act and the Newspapers (Incitement to Offences) Act marks the beginning of a process the completion of which has long been overdue. As has been pointed out again and again, the inauguration of the new era by the passing of the Government of India Act and the Royal Proclamation ought to have synchronised with the removal from the statute-book of every single measure calculated to restrict or interfere with the rights and liberties of the people. Unhappily it is the besetting weakness of a bureaucracy not to do right things at the right time, and even, to do them by halves. That is, do not follow the desires of the rebellious, who do not not judge by what God has revealed.